Kaiser's Room. Photo by Michael Bonasio. Kaiser’s Room. Photo by Michael Bonasio. 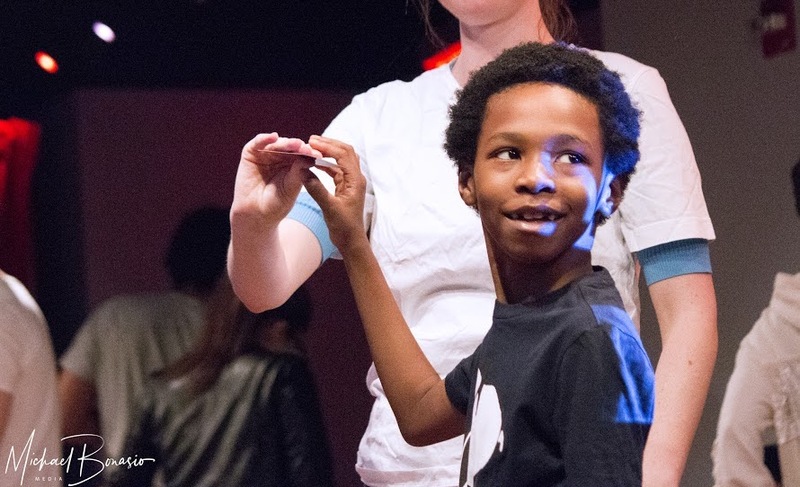 Duret’s experience working at Chicago Children’s Theatre’s Red Kite Project and then the Son-Rise program with a five-year-old autistic boy named Kaiser changed his life forever. Duret earned his BFA in musical theater and was already working professionally, but seeing how the arts could foster a deeper human connection gave him a new perspective and appreciation for its transformative power and purpose. 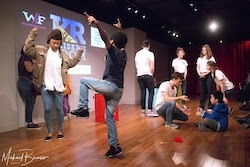 In 2015, Duret founded his own non-profit organization that would utilize the arts to promote imagination, inclusivity, connection and a culture of “yes.” He named the organization Kaiser’s Room. Classes are capped at just seven students, with between two and three teaching artists leading the room. This intimate setting allows for more individualized attention, where the teachers and students really get to know one another week after week. 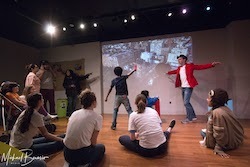 The arts offer a unique opportunity to integrate essential skills like communication, movement, language development and ensemble building into fun and engaging activities. Simple “arts” games can be really impactful. Crossing your hands to tap opposite knees across the body line actually fires important brain synapses. Clapping in rhythm, breathing deeply and isolating different body parts can be very grounding, especially when one’s body is on sensory overload. Once a person on the spectrum reaches age 21, they “age out” of government funding for education, classes, therapy and other activities. Perhaps resultantly, there is an 80 percent unemployment rate for adults with cognitive and developmental disabilities. “At Kaiser’s Room, our doors are open to anyone — ages three to 83!” explains Dallmann. “We don’t turn anyone away based on disability, age or any other reason.” Still, Kaiser’s Room focuses on keeping classes intimate and individualized. Another goal is to have greater representation of people with cognitive and developmental disabilities on their board of directors and staff of teaching artists. 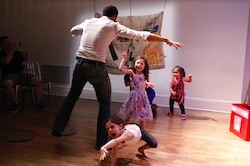 To learn more about Kaiser’s Room, donate to the organization, sign up for a class or inquire about a position as a teaching artist, visit www.kaisersroom.org.